Perhaps you are short on space and need to create an office area at home. The Amish Mini Lucern Mission Desk offers just the right compact size for an apartment, dorm room or bedroom. 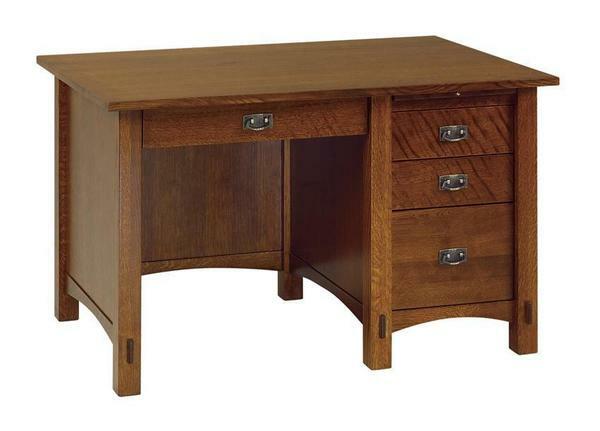 This lovely mission style desk is 48" wide and provides just the right amount of storage space. One pencil drawer provides room for writing tools, one file drawer keeps documents neat and organized and two storage drawers provide room for office items. All drawers are top notch quality, dovetailed drawers that provide strength for continued use. This desk has a sturdy 1" thick desk top and comes in the solid wood of your choice. The Mini Lucern is shown here in quarter sawn white oak wood which is known for its strength and texture. The unique way the oak log is cut makes quarter sawn oak more resistant to cupping or warping. Take a look at the matching Lucern Mission Two Drawer File Cabinet to use with this mission desk. This handcrafted desk is Amish made in America using the finest quality materials. Browse our collection of mission furniture for other areas of your home as well. Save time by shopping online and selecting the solid wood furniture with the custom options you're looking for. Call us today at 866-272-6773.